Annabella Price and Mark Bramhall: Photo Credit: Aaron Rumley. Love is the one human emotion that the entire world is constantly seeking and responds to no mater one’s age. How we respond to it is the stuff of theatre, movies, and novels. One need look no further than the stage of North Coast Repertory Theatre to enjoy and appreciate how the emotion called love drives the behavior of two people, of a ‘certain age’, who are seeking its benefits; no matter the cost or the age of its participants. From the pen of Irish playwright Christian O’ Reilly, comes “Chapatti”, a tender, poignant, and charming tale that bubbles with the lilt of Irish laughter, wit and charm for which those silver-tongued Gaelic writer/philosophers are known. If you thought that ‘alchemy’ was a lost art, think again. 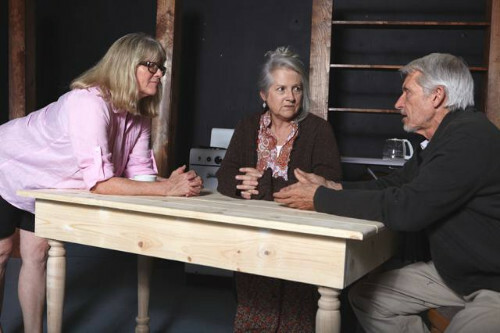 Award-winning Broadway and Hollywood director/actor Judith Ivey brings her considerable talent and skills to the stage of North Coast Rep to create gold in the form of a two person cast that stars actors Mark Bramhall and Anabella Price. Kudos to artistic director David Ellenstein, for once again, bringing the gold standard in talent to the audiences of North Coast Repertory. The story of Dan and Betty, is a tale of two senior working-class suburban Dubliners who discover one another by coincidence at a veterinarian’s office. He’s a dog lover. She’s a cat person. Dan’s a widower who’s having difficulty in getting through his grieving period. He keeps thinking of his Margaret, all alone up there; waiting for him to join her. He is a bit of the working-class dreamer when it comes to facing reality. Betty, on the other hand, is a divorcee who knows she still has plenty of love and compassion in her and is just waiting for the right man to come along to share her feelings. Her dialogue is achingly poignant at times and delivered with such a ring of authenticity that her astonishing performance can’t help but resonate with the females in the audience (and a few of us men as well). Dan is winningly and guilelessly played by Mark Bramhall in a nicely nuanced performance. Anabella Price, is an absolute gem of an actor who looks and sounds as if she just finished a performance run at Dublin’s famed Abbey Theatre. And, the on-stage chemistry between Price and Bramhall is a delight to behold, in the bargain. Between Bramhall’s laidback Dan and Price’s no-nonsense Betty, the audience can cancel their airplane tickets to Ireland in the hope of seeing a slice of working-class Irish life. That experience can be seen and felt by attending a performance of “Chapatti”. Incidentally, the title of the play is the name of Dan’s dog, a stray he rescued to later name it after a favorite Indian food of his and Margaret’s. 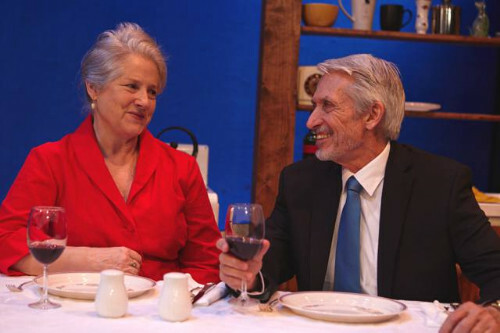 “Chapatti” runs at the North Coast Repertory Theatre through November 15, 2015. Don’t miss it.